WE SPECIALIZE IN PROVIDING ENTERTAINMENT SERVICES TO SENIOR COMMUNITIES (NURSING HOMES, ASSISTED LIVING FACILITIES, RETIREMENT COMMUNITIES, ADULT DAYCARE, REHABILITATION CENTERS, ETC...), AND WISH TO ENGAGE THE HEARTS AND STIMULATE THE MINDS OF THE SENIORS IN YOUR COMMUNITY. 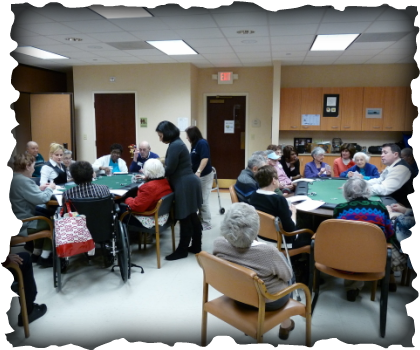 WE SPECIALIZE IN TEACHING POKER TO THE SENIOR COMMUNITY. WE DO THIS BY HOSTING FUN POKER GAMES FOR YOUR CLIENTS. IT'S ALL JUST FOR FUN BUT WE PROVIDE THE WINNERS WITH A PRIZE! A PROFESSIONAL DEALER MAKES SURE THE GAME RUNS SMOOTHLY. THE DEALER IS ALSO RESPONSIBLE FOR PROVIDING INSTRUCTION USING ALL THE RULES FOLLOWED BY ATLANTIC CITY POKER ROOMS. THE RECOMMENDED SESSION LASTS FOR AN HOUR AND A HALF WITH UP TO 9-10 PLAYERS FITTING AT A TABLE. OUR GOAL IS TO MAKE THIS A RECURRING PART OF YOUR ENTERTAINMENT SCHEDULE (SUCH AS A TUESDAY AFTERNOON POKER PROGRAM). THEREFORE, WE TRY TO MAKE IT AS AFFORDABLE AS POSSIBLE.